St. Catherine was born near the beginning of the fourteenth century to parents Ulfo and St. Bridget of Sweden. At the age of seven, Catherine was sent to the Abbey at Risburgh by her parents and placed under the care of the abbess to receive an education and to build a foundation for her spiritual life. At the age of 13, Catherine was taken from the abbey and given in marriage to Egard, a German nobleman. Upon meeting Egard, Catherine persuaded him to make a mutual vow of perpetual chastity with her. Catherine and Egard dedicated themselves to the service of God and encouraged each other in works of mortification, prayer and charity. Around the year 1349, after the death of her father, Catherine accompanied her mother on a pilgrimage to Rome to visit the relics of the Roman Martyrs. The two spent several years living in Rome. In 1373 St. Bridget died and Catherine returned to Sweden with her mother's body. Two years later, Catherine returned to Rome to promote the cause for her mother's canonization and to gain approval for a Rule she had written for a group of religious women. After gaining approval for her rule, Catherine returned to Sweden and became abbess of Vadzstena. Catherine served as abbess of Vadzstena until her death in 1381. 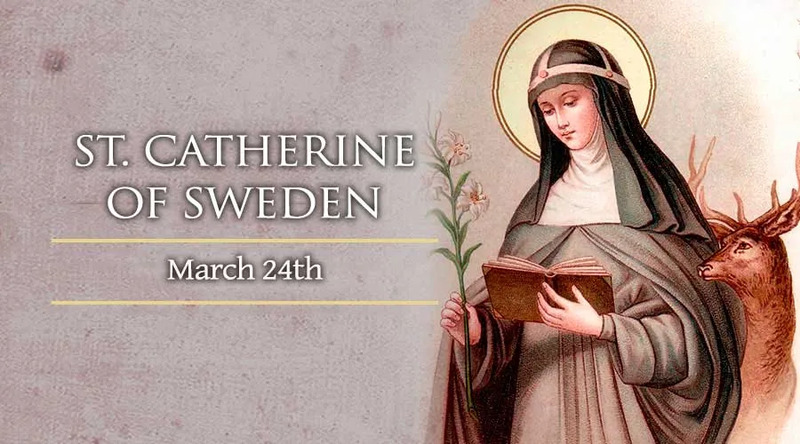 During the final 25 years of her life, Catherine was known for her austere lifestyle and her practice of making daily use of the Sacrament of Confession. St. Catherine was canonized in 1484 by Pope Pius II.